SANSA Space Science, Hermanus, South Africa is seeking a strong researcher to undertake a postdoctoral fellowship in Solar Physics within the Space Weather Centre in Hermanus, South Africa. Applicants must hold a Ph.D. in physics with a strong focus on solar physics. They should have an outstanding research record and relevant experience in solar instrumentation, data analysis, and/or theory and numerical modeling. Applicants should be able to bring knowledge and insight into the area of solar physics and be prepared to demonstrate this knowledge and contribute to the growth of the facility. Within this position SANSA expects research independence and originality resulting in publications in peer‐reviewed journals. In addition, the successful applicant will be required to collaborate with the Space Weather Team and other scientists at SANSA. Academic education of young researchers and participation in the acquisition of third‐party funding is required in this position. Applicants with a recent Ph.D. are particularly encouraged to apply for this position. This position is initially a one year performance based contract. An additional year’s contract will be considered following the evaluation of the successful applicant’s performance. Please note that this vacancy exists in Hermanus, Western Cape, South Africa and the successful applicant will need to be based in Hermanus. Deadline for application 2nd April 2013! More information on SANSA and the Space Science Directorate can be found on http://www.sansa.org.za, from where there is a link to the full job announcement. Photo of Hermanus courtesy of Wikimedia Commons (link). High-latitude ionospheric response to the solar eclipse of 1 August 2008: EISCAT observations and TRANSCAR simulation, by F. Pitout, P.-L. Blelly, D. Alcaydé, J. Atm. Sol.-Terr. Phys., 19 February 2013 (link). Case study of an ice void structure in polar mesospheric clouds, by Brentha Thurairajah, Scott M Bailey, David E Siskind, Cora E Randall, Michael J Taylor, James M Russell, J. Atm. Sol.-Terr. Phys., 19 February 2013 (link). Day-time F-region echoes observed by the São Luís radar, by E.B. Shume, F.S. Rodrigues, E.R. de Paula, I.S. Batista, M.D. Butala, D.A. Galvan, J. Atm. Sol.-Terr. Phys., 19 February 2013 (link). Absence of streaming plasma waves around noontime over Thumba in recent times: Is it related to the movement of the dip equator?, by R. Sekar, S.P. Gupta, Y.B. Acharya, D. Chakrabarty, D. Pallamraju, B.M. Pathan, Diwakar Tiwari, R.K. Choudhary, J. Atm. Sol.-Terr. Phys., 24 February 2013 (link). Last night a large geomagnetic storm blew over the Earth, creating fantastic northern lights, which were seen at least as far south as Estonia. 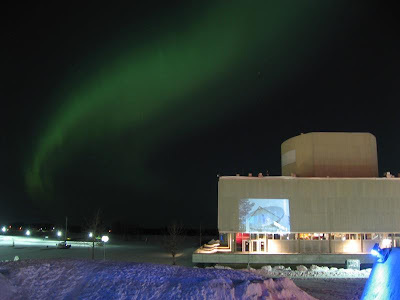 Last night I was stuck in the centre of Oulu, equipped only with my old, simple IXUS 800IS camera. However, while trying a few shots on the market square, I was utterly surprised to have captured a projection of the Sodankylä EISCAT radar dish on the wall of the Oulu theatre, suitable looking at the aurora! That's something I've often tried, but never managed to do with any of the real EISCAT radars. Science Tuesday: MSIS Atmosphere Model – The Geekiest App? This surely must be the geekiest app for any atmospheric scientists to have on a phone or tablet. You can now download the widely used "Mass Spectrometer Incoherent Scatter" (MSIS) Atmosphere Model from the iTunes App Store! The MSIS model, is a widely used tool in atmospheric modelling, which provides neutral atmospheric composition and temperature from ground to near-Earth space. The main differences between NRLMSIS-00 and MSIS-E-90 "involve (1) the extensive use of drag and accelerometer data on total mass density, (2) the addition of a component to the total mass density that accounts for possibly significant contributions of O+ and hot oxygen at altitudes above 500 km, and (3) the inclusion of the SMM UV occultation data on [O2]." The MSIS-E-90 Atmosphere Model "describes the neutral temperature and densities in Earth's atmosphere from ground to thermospheric heights. Below 72.5 km the model is primarily based on the MAP Handbook (Labitzke et al., 1985) tabulation of zonal average temperature and pressure by Barnett and Corney, which was also used for the CIRA-86. Below 20 km these data were supplemented with averages from the National Meteorological Center (NMC). In addition, pitot tube, falling sphere, and grenade sounder rocket measurements from 1947 to 1972 were taken into consideration. Above 72.5 km MSISE-90 is essentially a revised MSIS-86 model taking into account data derived from space shuttle flights and newer incoherent scatter results. 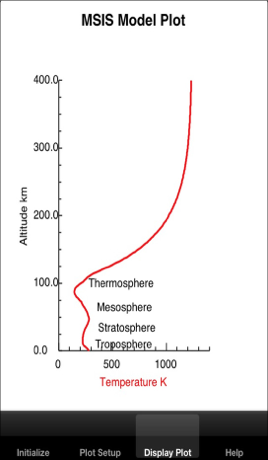 For someone interested only in the thermosphere (above 120 km), the author recommends the MSIS-86 model. MSISE is also not the model of preference for specialized tropospheric work. It is rather for studies that reach across several atmospheric boundaries." For download available are iOS versions for iPhone and iPad, and they are kindly provided free of charge by the MSIS main author, Alan Hedin. Image credit: Atmospheric profile image is taken from the iTunes App Store's page for the iPhone version.